Our nylon U.S. 3'x5' flag are created using aniline-dyed 100% heavyweight 200-denier bunting, sewn stripes and embroidered stars. This material is fast drying, treated to resist fading and moves with the slightest breeze. Finished with a header and 2 grommets for mounting on the included pole set. The pole set include all the necessary hardware, including a gold eagle pole topper. 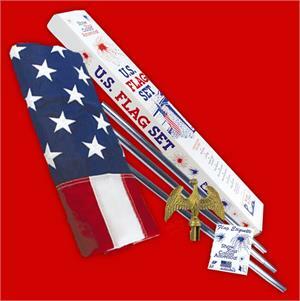 Show your patriotic spirit with this affordable residential U.S Flag kit.